Most of the time frames referenced on this page are complete speculation but built on some truths and reasonable assumptions. My speculative story about Pluto begins at our local solar system's origin. Our Earth is at least 4.374 billion years old based on Uranium lead dating of Zircon found in Western Australia (oldest on Earth). Earth is likely older based on meteorites from our solar system that have been tested to be 4.568 billion years old. I'm going to assume our Earth's age to be at 4.5 billion years to make the math easy. That means, about 5 to 6 billion years ago a massive star went super nova creating a nebula of dust and gas (similar to the one below) forming a stellar nursery from which our Sun and planets formed. Everything that exists on and around our planet was formed from this explosion. There were many other similar sibling Suns (stars) with planets formed from this massive stellar nursery one of which we've identified from its nearly identical composition and orbit, it is called HD 162826 (silly name for our twin). Here we are then at 5 Gya (billion years ago) when our solar system is a cloud of dust and frozen hard gasses of H, He, H2O, N2, C, O, CH4 CO as well as other gasses but these few existed in large quantities especially Oxygen and Hydrogen which formed lots of H2O ice. While all the gasses were initially similar, temperature and pressure eventually created zones where variations developed. ​In 500 million years, the original dust/gas cloud accretes into an organized disk and becomes a young solar system. Our solar system is now 4.5 Gya. A large cloud of dust and gas began to clump together forming a central area of increased mass. As the gravity from the center grew, more and more gasses were sucked into the core causing a spiral spin within the cloud. The center of the gasses grew larger creating gravitational zones creating rings where material would coalesce forming planets. At this stage, Earth and the other planets are formed mostly out of colliding comets. There hasn't been enough UV heat to sublimate the ices. Eccentric orbits along with resonant pulses similar to Jupiter's Io is the primary early source of heat from tidal stretching. In time, the orbits settle the Sun ignites and it's energy output increases creating asteroids by exiting volatile gasses leaving behind larger quantities of rock and metals. ​Kuiper Belt Objects, however, are further away from the Sun's influence and more widely dispersed thus they would accrete and grow more slowly remaining more like comets than asteroids with energy coming primarily from impacts and tidal flex. ​At this stage Neptune is closer to the Sun but is flung outward by a resonant push from both Jupiter and Saturn (Nice Model) this process takes about 700 million years. ​As Neptune's orbit increased, it picked up some moons and hurled objects in toward Earth creating the late heavy bombardment. Around 3.8 Gya Neptune migrates near to its current orbit interacting with objects in the Kuiper belt. Actually, it creates the Kuiper belt by pushing objects inward or outward from its orbit and organizing some into zones of resonance. At this stage Neptune's orbit is eccentric. For another billion years (2.8 Gya) Neptune sets up resonant frequencies with Classical Kuiper Belt Objects (KBO) called cubewanos. Cubewanos are objects that remain beyond 50 AU (50 times farther than Earth) from the sun. When Neptune perturbs their orbits in a 3:2 resonance and causes them to migrate closer to the Sun they are called plutinos the largest of which is Pluto. ​​Plutinos are cubewanos that have been pushed into eccentric orbits which place them periodically nearer to the Sun's UV energy allowing for more aggressive development of tholin like the Kuiper Belt Object called 1994 JR1. In contrast, cubewanos remain in a more circular and/or spherically inclined orbit of 50 AU from the Sun. This may be why Charon is gray and compared to Pluto is a relative young comer to the binary pair party. Cubewanos with inclined orbits greater than 12 degrees tend to be bluish in color and are called hot objects. Cold Cubewanos have less inclined orbits and are more frequently red containing tholins. Charon then is likely a captured hot Cubewano while Pluto is a cold Cubewano both of which were forced into a 3:2 resonance with Neptune causing the two objects to be Plutinos with differing compositions. Moving forward to 2.8 Gya, Pluto is alone and does not have its companion Charon. At this stage, Pluto is small, alone and is corralled by Neptune into a clustered group of objects, this causes comets to cross Pluto's path allowing it to grow slowly and steadily becoming the big shot of the Plutino group. Neptune also perturbs Pluto into an eccentric (off center) elliptical (squished) inclined (17 degree) orbit around the Sun, this sets up the conditions to create tholin. This puts us around 2 to 1.5 Gya when Neptune pushes another cubewano called Charon into near proximity to Pluto but at this early stage they were in eccentric elliptical orbits with each other. Their spiral dance was more erratic and energetic. This new bluish gray Cubewano called Charon enters the scene from a steep inclination much greater than their current 17 degree angle which induces an imbalanced torque, tilting the two planets eventually to 120 degrees and sets up tidal stretching conditions that knead the pair like dough creating a softened magma material below each planet's surface..
​​Over time (approximately a billion years) they will settle into tidally locked circular orbits with 120 degree tilted axes but for now this uneven mass and tidal stretching creates a subsurface ocean of thick magma containing a mix of nitrogen/methane/carbon monoxide fluid below the surface of both planets. The fluid is the buffer material between the inner and outer spheres created by all the heat induced twisting torque forces created by Charon's newly introduced gravitational mass. As Charon and Pluto orbit each other eccentrically, they are both gravitationally and gyroscopically turned, twisted and torqued into their new complementary spin angles of torque induced tilt. Their combined mass acts to attract, gravitationally, more objects than each would have done individually. This has the effect of increasing KBO impacts and drawing larger objects into striking range. As a thick viscous fluid is formed from all this heat friction the nitrogen magma mix expands, in turn, creating fractures or stretch marks. During this period both planets are increasingly pelted by objects primarily gray colored cubewanos one of which hits Charon at its 8 O-Clock position creating a diagonal fracture separating the northern hemisphere from the south. We are now at about a billion years ago. At this stage Pluto and Charon's orbit is circular and now they derive their tidal stretching energy from their linear alignment with the Sun at perihelion. The subsurface magma previously created is now sustained by periodic flexing and Sun light. Pluto may have formed a rocky core during this period but that's a stretch (get it? :-). 1 Gya Charon collides with a red plutino or cubewano object like 1994 JR1 on its north pole fracturing its southern hemisphere while at perihelion and linearly aligned with Pluto and the Sun which assisted in gravitationally ripping off some shards from it's southern hemisphere. With the southern hemisphere fractured, Charon's gravity collapsed its crust into a basin forcing magma onto the surface. This created its smooth southern surface. ​The dislodged shards ejected at varying velocities. Some fell back onto Charon, some hit Pluto and some ejected into space. The shards that launched into space had enough energy to achieve high orbital velocities these became the moons Hydra and Kerberos. The shards that hit Pluto sent phonon shock waves reverberating through Pluto cracking it and breaking pieces off at the lower area of Sputnik Planum creating deep pits as fragments or chunks launched into low orbit. ​Some of the objects ejected from Pluto were bright as ice while others were covered in tholin one of which later impacted Nix. Near the deepest fracture, along Sputnik Planum's western edge, cryovolcano fissures develop to relieve pressure while the basin at SP is filled with toothpaste consistent nitrogen. ​Pluto and Charon at this point are tidally locked and are held together like two dumb bells held together by a rigid bar. As they spin the centrifugal force along with Charon's gravitational pull which is focused at SP caused Pluto's crust to collapse inward creating a basin much like we see at both Thingvellir Iceland and on Charon. This created additional subsurface pressures bulging and folding the land ice and squeezed the warmer denser nitrogen out and onto the surface softening the surface ices creating the burp bulge at Viking Terra, the south pole ridge line's compression fold mountains, the upland/wetlands, the spider and Tartarus Dorsa. Additionally, to the east of SP, the warm nitrogen fluid bubbles up from below like hot mud and creates the south facing wind blown mud dauber features. The underground pressure also creates the spider's fractures and the domed shaped mud mountains which line them at Tartarus Dorsa. This brings us to about a year ago where Alan Stern and his team at NASA has (via New Horizons) allowed us to speculate on the wonderful details that may have formed this incredible geologically alive and currently active Pluto/Charon system. Congratulations and thank you to all the men and women that pulled this off and have so generously shared this information with the world. My primary reason for presenting this scenario was to display Pluto's story as a growth process an evolving, changing series of progressive events rather than the static idea that everything happened in 500 million years then sat dormant for 4 billion until the present day. I'm not pretending to actually know these things occurred as I've indicated but they could have and it seems to be a reasonable theory. I could get much more detailed (and have) but you can read those thoughts on pages 1-43 to fill in the blanks, if you like. That's Pluto's story and I'm sticking to it at least until I figure out (or hear) something better. I am fascinated by Nebulae. These gas/dust clouds from which life is born are intriguing and most fascinating. If you are, likewise, fascinated and intrigued by nebulae, below are some which were photographed by the Hubble, Spitzer and Chandra telescopes. The "Star Trek Enterprise collides with the Klingon Bird of Prey Nebula". The Enterprise is on the right. The next six images are proplyds within the Orion Nebula. A proplyde is a protoplanetary disk or a rotating circumstellar disk of dense gas and dust surrounding a young newly formed star. You can enlarge them by clicking. These are the early stages of a solar system's formation. The next four images are of Star V838 Monocerotis exploding over the course of 2 to 4 years. Wolf Rayet stars are a class of exploding stars that are very hot and are usually abbreviated WR stars like the one below. 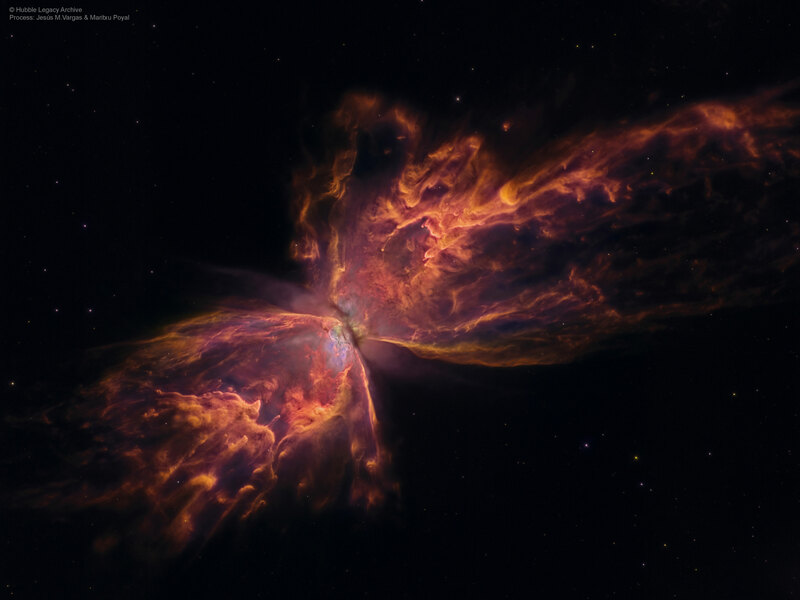 Some of the above Nebula images came from a web site called Rocket Stem its worth a visit. Their images are larger and contain details about their authors, if you have some time, visit their site. The universe is such a beautiful place, why do we choose to pollute and destroy this little pearl of a planet we call Earth? Its not like we can just get off at the next nebula and start over.